Despite its great public transport links, the existing National Sports Centre (NSC) in Bukit Jalil enjoys crowds only on event days. Now the Malaysian government hopes to change things round by making the complex an attraction itself. Whether by adding new iconic structures, successful commercialization of existing ones or (most likely) both these measures, the complex should be brought to life on a daily basis. Sources said 11 companies have participated in a competitive tender for the construction and refurbishment works worth more than RM1bil at the NSC. Initially there were 15 companies interested, but 4 of them opted out of the competition. It is learnt that established players in the construction industry including UEM Sunrise Bhd, IJM Corp Bhd, WCT Bhd, Malaysian Resources Corp Bhd (MRCB) and the Naza Group are among the companies vying for the job where the most competitive bid in terms of financials and technicals will be paid in the form of land. The contract is said to be worth MYR 1 billion ($262m). “The companies have been working on the project for more than a year and it is going into the final lap before a decision is made,” said a source. The National Stadium, still among largest and most impressive worldwide, will soon reach the age of 20. This means renovation is inevitable and the new project may speed things up. 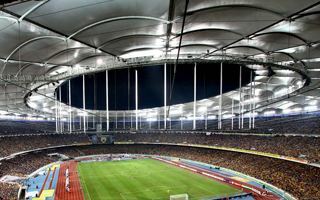 A spokesperson from the Youth and Sports Ministry confirmed that plans to construct new facilities and refurbish the existing stadiums in Bukit Jalil were in the works.